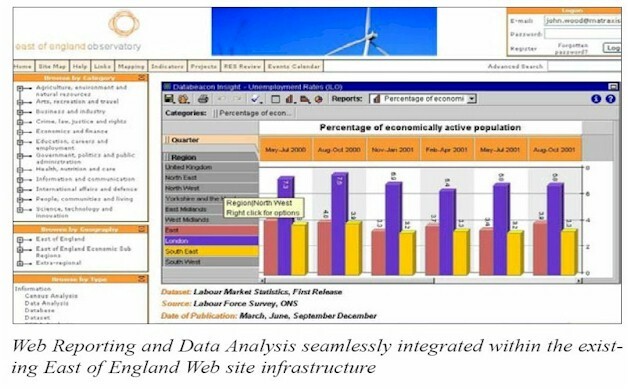 The East of England Observatory (www.eastofenglandobservatory.org.uk) is a resource discovery system for policy makers and researchers working on projects that relate to the economic development of the East of England. The web site contains, or links to, information resources about the social, economic and environmental structure of the region. It is compliant with U. K. e-Government Metadata Standards. The site is maintained by the Policy Unit of the East of England Development Agency and is also available for use by other organizations that work in partnership with the agency. A key aim of the site is to monitor the main indicators of the state of the region for use in developing the regional economic strategy. According to Tom Morrison, East of England Observatory Manager, "One of our objectives in this project was to replace a system of around a hundred indexed spreadsheets of data. We needed to provide the information in an easier to use format. We were drawn to Databeacon Web Reporting and Data Analysis software after investigating other alternatives on the market. Key factors in our decision were ease of use and the clear presentation of the information as well as the scope for the interested user to manipulate the data themselves." Another important aspect of the strategic decision to implement Databeacon was due to its availability as a hosted service that offers a low cost, low risk, fast return solution - making it an I.T. services versus software product procurement. The hosted solution was developed by Databeacon�s UK partner Matraxis LTD. - who delivered the complete software solution, including consulting, training and support. Matraxis consultants also assisted in the development of a package of Regional Economic indicators for the site that are now easily accessible for internal and external users and partners. The result has been a turnkey, hassle-free software solution which is proving popular. "We consider the Matraxis-Databeacon solution to be a major enhancement to the site," says Morrison. You can view a web-based slideshow of the East of England Observatory reporting capabilities originally built using Excel and then built using Databeacon by following the link. Databeacon software employs a data publishing architecture that is designed to leverage the power of the Internet. It offers the capabilities of reporting and analysis applications with a light load on I.T. resources, and a satisfying end-user experience that requires no software installation, training or manuals. Databeacon's Data Publishing tools are built on a Java platform, enabling information consumers to interact with and graphically analyze data over the Internet. The client tool, called the Databeacon Insight viewer, is an applet that automatically loads in the information consumer's browser. To enable analysis using the Insight viewer, the server extracts data from a data store such as a relational database, reformats the input data into a compressed, aggregated format called a cube, and embeds the cube inside an HTML page returned to the information consumer. Upon receiving the page, the browser automatically loads the Insight viewer, which reads the cube into memory, then presents the data in interactive graphs and tables. The architecture (see Figure 1) provides a foundation for scalable Web reporting and data analysis. IT administrators/data publishers use the Databeacon designer tool to create a layout of the data, and save the final layout as a cube profile. The heart of the architecture is the Databeacon publish tool, dbPublish. It extracts and transforms data according to the mappings in the cube profile, and creates an HTML file that includes the compressed aggregated data. The challenge was to provide regional performance data on-line in a way that allowed users easy access to reporting and analysis tools. The solution was Databeacon Web Reporting and Data Analysis software implemented as a hosted service. The new service was integrated within the existing web site infrastructure. The IT Infrastructure was the .NET platform and a SQL database. The return on investment has come from replacing more than 100 spreadsheets. Currently there are more than 1000 registered users, including policy makers and other parties interested in projects that affect the socio-economic development of the East of England. The East of England Observatory is a dedicated interactive web site maintained by the Policy Unit of the East of England Development Agency (EEDA) for the benefit of the agency and its partner organisations. Contributions of resources from partners are welcomed. 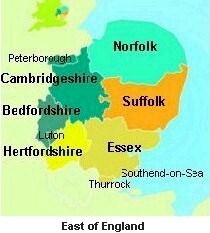 The site seeks to collect, analyse and disseminate key regional information in order to present an accurate and continuously updated picture of the socio-economic and environmental structure of the East of England. The East of England Observatory was launched as a resource for the use of EEDA's partners in 2001. The Web URL is www.eastofenglandobservatory.org.uk. Postal Address: East of England Development Agency, Policy Unit, The Business Centre, Station Road, Histon, Cambridge, CB4 9LQ, England, United Kingdom. Matraxis is a specialist in dynamic data publishing, analysis, reporting and web analytics. Matraxis brings a software led approach to solution delivery based on advanced and functionally rich technology. The Web URL is www.matraxis.co.uk. Since 1995 Databeacon has built out its Internet-specific, browser-based web reporting capabilities to include robust Online Analytical Processing (OLAP) analysis. This approach - which allows for highly scalable deployments at a competitive cost and with short implementation times - allows Databeacon to target opportunities outside of the realm of more established vendors running on older product architectures. These opportunities include a growing number of Independent Software Vendor (ISV) relationships with other companies looking to add reporting and analysis functionality to their existing software solutions. Databeacon is Web Reporting and Data Analysis software for mid-market (100-1000-employee) companies or departments of larger organizations. With more than 800 customers worldwide, Databeacon's corporate headquarters are in Ottawa, Canada. The company has more than 100 reseller and OEM/ISV partners located in 27 countries around the world trained to both advise on and implement web reporting and data analysis projects. Andrew Coutts is the President and CEO of Databeacon. The Web URL is www.databeacon.com/. What is the purpose of the web analytics? Is this a data-driven Decision Support System? Why or why not? What is a hosted service? What is the major benefit of using Databeacon rather than Excel for providing analytical information to decision makers? Why? Should other regional development groups create this type of decision support capability? Why or why not? Databeacon Staff, "East of England Observatory adopts hosted services decision support solution", May 14, 2004, at URL DSSResources.COM. For further information about the East of England Observatory contact Lisa Boothroyde, tel: 01223 200819, email: lisaboothroyde@eeda.org.uk. Carrie Parent, High Road Communications, provided permission to use this case study and screen shots at DSSResources.COM on April 14, 2004. Contact her at email cparent@highroad.com. This case study was posted at DSSResources.COM on Friday, May 14, 2004.